The catchphrase of 2014/2015 was, and is, big data- data sets that are so vast and complex that they need intensive resources to process. But what is the point of data if we cannot process it, analyze it, and effectively communicate it to our stakeholders? Within the Corporate Social Responsibility sector, data legitimizes our efforts and encourages support from internal and external stakeholders. Without properly collecting and communicating the results of our volunteering and giving, CSR efforts can be diminished. 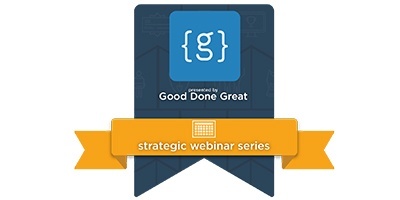 Join Good Done Great and CSRHub for a one-hour webinar discussing data-driven story-telling within the Corporate Social Responsibility space discussing topics such as how to collect the correct data, analyze it, and share it with both external and internal stakeholders. - Why is CSR data important? - What data should CSR departments collect? - How do CSR departments make sense of this data? - How do CSR departments effectively communicate this data? - Which companies are correctly collecting data & communicating their stories? Your CSR programs are only as effective as the impact and the stories they tell! Don’t miss out on this interactive session with two thought leaders in the technology, CSR, and data analytics space! Good Done Great revolutionizes the way corporations and individuals give back to the communities and causes they care about. Through strategic consulting supported by our integrated software solutions, the Good Done Great team helps Fortune 500 and other companies maximize their corporate social responsibility (CSR) programs. CSRHub provides access to corporate social responsibility and sustainability ratings and information on 15,143+ companies from 135 industries in 132 countries. Managers, researchers and activists use CSRHub to benchmark company performance, learn how stakeholders evaluate company CSR practices and seek ways to change the world. Christina Bowen leverages over 25 years of public relations, corporate giving, and strategic planning experience in her role as Vice President at Good Done Great. She works directly with Fortune 1000 groups, including Grainger, PPL, Ecolab, and Barrick Gold to deliver integrated CSR programs that increase employee engagement while delivering upon real business goals. Cynthia Figge, Co-Founder and COO of CSRHub, is a forerunner and thought leader in the corporate sustainability movement who co-founded EKOS International in 1996, one of the first consultancies integrating sustainability and corporate strategy. Cynthia has worked with major organizations including BNSF, Boeing, Coca-Cola, Dow Jones, and REI to help craft sustainability strategy integrated with business. She was an Officer of LIN Broadcasting/McCaw Cellular leading new services development and started a new “Greenfield” mill with Weyerhaeuser. She serves as Advisor to media and technology companies and served as President of the Board of Sustainable Seattle. Cynthia has an MBA from Harvard Business School. Cynthia is based in the Seattle area.